Last night Stanley’s Camp radioed Doug to inform him a guest had purchased the activity option of joining us on a foraging trek. In partnership with Doug and Sandi, the hosts at Stanley’s offer their guests the experience of a lifetime – an opportunity to walk for several hours through the bush with three unfenced and unfettered elephants, culminating in a picnic lunch at the end of the trek. As we walk along the dusty road to the rendezvous point for Stanley’s guests, Doug tells me we will meet up with Stacey from New York City. Rather than submitting to elephant-back safari rides, Jabu, Morula and Thembi provide one-on-one interactions with guests like Stacey, a unique chance to learn how elephants behave in the wild from elephants who accept humans as part of their herd. The posh tents at Stanley’s Camp are located in a private concession at the southern tip of Chief’s Island, four hundred square miles of dry land in the vast wetlands of the inner Delta. Private concessions in Botswana lease exclusive tourism use of wildlife areas from community trusts, providing both jobs and taxes. A committee elected from the six villages within the community trust area NG32 leases 406 square miles to Stanley’s parent company, Sanctuary Retreats. Exclusive use means exclusive sightings of game – no flocks of vehicles following a single lion. It also gives Jabu, Thembi, Morula – and their local wild cousins – a daily life without a huge human presence. Only one sandy pass-through road connects concession to concession. It is lightly traveled, used mainly by the occasional researcher or for overland supply trucks. Most tourists fly in. Our rendezvous point with Stacey is an island of bush. In the surrounding lagoon of grass a few stalks shiver and crosshatch as a mouse or grasshopper nibbles at their stems. Otherwise, the lagoon is perfectly still. The island is a good hiding place for elephants. Sandi and I will step out to the road when we hear a vehicle coming. No, I haven’t. Not many chances to do that, where I live. “Steady Morula.” He puts both hands up by her left eye and uses them to hold it open. 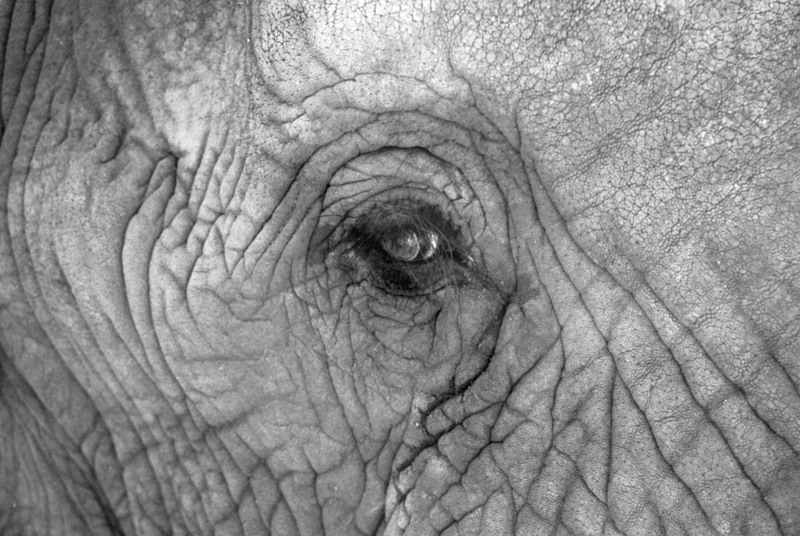 An opaque membrane slides from the corner of her eye toward the front of her face, toward her trunk. Such trust, I think. I hate it when a doctor holds my eye open, shines a bright light into it and causes tears to course down my cheek. Morula’s tears are oilier than mine are, produced by a gland in the nictitating membrane and from a modified sebaceous gland located in her eyelids. Human tears originate from large lachrymal glands located behind our eyebrows which discharge when irritated or when we are emotional. When our tear ducts (actually drains) are overwhelmed, tears spill from the corners of our eyes. Doug releases Morula’s eyelids. She blinks several times, then knuckles her eye with the tip of her trunk curled as tight as a fist. As she rubs a dark smudge, a triangle of tears, spreads like a delta from the corner of her eye. Morula and I stand together, watchers watching, measuring each other. Steadfast, she looks down her nose at me. I gaze upward into an iris of liquid oak with sun flecks and shadows in it. I remember the camera hanging from my neck and lift it. I feel the earth breathing, the air turning older; each moment caught, then left behind. The light from her eye just now reaches mine.